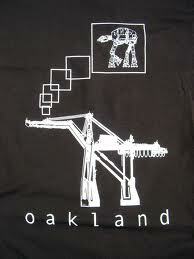 A few posts back I wrote a haiku poem called Cranes in the Sunset and made a passing reference to the Oakland shipping cranes being the inspiration for the walking war machines in The Empire Strikes Back. My unofficial fact checker quickly replied to the post and said that George Lucas himself had denied any connection between the two. I won’t argue with Mr. Lucas if he said that, but I can’t tell you how many times I’ve encountered that connection over the years, both in print and verbally. You can even buy a t-shirt like the one pictured above. The myth was repeated so many times that Mr. Lucas felt compelled to set the record straight. It goes to show how something can take on the force of truth through simple repetition.